This exterior comes with a 40-year guarantee against rot and termites. Its neutral color will go with almost any environment. Natural looking exteriors including Western Red Cedar, Kiln Dried, Premium Knotty, and Tongue & Groove paneling are resistant to decay and insect damage. In fact, wood exteriors can remain sound for over 100 years. Cedar sidings natural characteristics of dimensional stability, easy fabrication, light weight, and beauty ensure your siding will be admired for years.Log siding is a popular way to capture the feel of Americana. 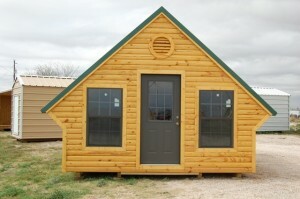 Quality log siding adds a rustic appearance and can be customized through color staining the wood. *We suggest that all exposed wood exterior have a UV protectant applied annually to maintain its appeal, and all exterior wood can be stained with protectant. Ask our team about solving your storage needs.